Eldon band instruments were created by Antigua Winds with the beginning musician in mind. Each Eldon instrument encompasses the finest features and quality that come from years of experience combined with modern manufacturing techniques. Eldon produces instruments with the desire that your "First Step in Music" be positive and rewarding. 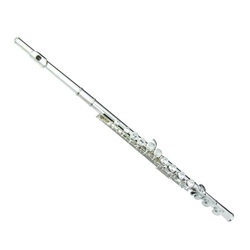 This silver plated C flute features plateau style closed-holes and comes with a lighweight collegiate case.